Lucy is a 25-year-old American woman living and studying in Taipei, Taiwan. She is tricked into working as a drug mule by her new boyfriend, whose employer, Mr. Jang, is a Korean mob boss and drug lord. Lucy delivers a briefcase to Mr. Jang containing a highly valuable synthetic drug called CPH4. After seeing her boyfriend shot and killed, she is captured and a bag of the drug is forcibly sewn into her abdomen and that of three other drug mules who will also transport the drug for sales in Europe. While Lucy is in captivity, one of her captors kicks her in the stomach, breaking the bag, releasing a large quantity of the drug into her system. As a result, she begins acquiring increasingly enhanced physical and mental capabilities, such as telepathy, telekinesis, mental time travel, and can choose not to feel pain or other discomforts, in addition to other abilities. She kills off her captors and escapes. Lucy travels to the nearby Tri-Service General Hospital to get the bag of drugs removed from her abdomen. 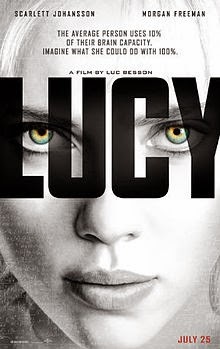 The bag is successfully removed, and Lucy is told by the operating doctor of the volatile nature of the drug, based on a substance given to fetuses during prenatal development, and its destructive side-effects. Sensing her growing physical and mental abilities, Lucy returns to Mr. Jang's hotel, kills his bodyguards, assaults Mr. Jang, and telepathically extracts the locations of all three drug mules from his brain. At her shared apartment, Lucy begins researching her condition and contacts a well-known scientist and doctor, Professor Samuel Norman, whose research may be the key to saving her. After Lucy speaks with the professor and provides proof of her developed abilities, she flies to Paris and contacts a local police captain, Pierre Del Rio, to help her find the remaining three packets of the drug. During the plane ride she starts to disintegrate as her cells destabilize from consuming a sip of champagne, which made her body inhospitable for cellular reproduction. Only by consuming more CPH4 is she able to prevent her total disintegration. Her powers continue to grow, leaving her able to telepathically incapacitate armed police and members from the Korean drug gang. With the help of Del Rio, Lucy recovers the drug and hurries to meet Professor Norman, with whom she agrees to share everything she now knows, after he points out that the main point of life is to pass on knowledge. Jang and the mob also want the drug and a gunfight ensues with the French police. The trailer was good so it got us wanting to watch the movie. After watching it, we were thankful we didn't watch it in the cinema. The serious storyline, intriguing at first but slowly becomes illogical. I really don't get the ending, left me clueless... Lucy is everywhere? A pendrive? Definitely 1 of those movies where we just enjoyed the acting and scenery, nothing else.